When you save your presentation to OneDrive or SharePoint Online for Office 365, you can collaborate on a presentation at the same time with your colleagues. 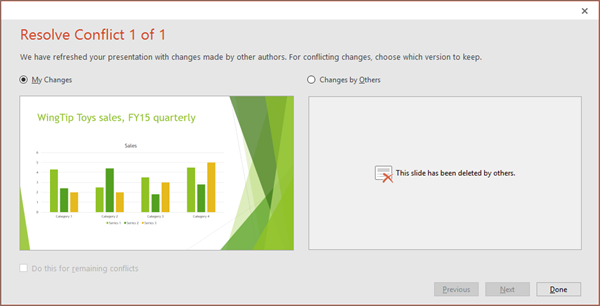 In order to work on a presentation at the same time, all authors need to be using PowerPoint 2013 or later (on Windows), PowerPoint 2016 for Mac or later, or PowerPoint Online. 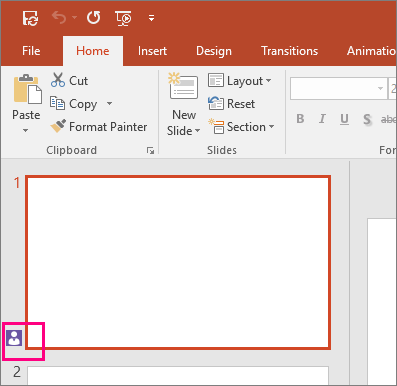 Open your PowerPoint presentation, and choose Share in the top-right corner of the ribbon when you're ready to collaborate. In the Invite people box, enter the email address of the person you'd like to share the presentation with. If you already have the person's contact info stored, you can just enter the name. The drop-down list lets you determine whether your invitees can edit the file or only can view the file. Click Share. If your file has already been saved to the cloud, an email invitation will be sent to your invitees. If you haven't saved your presentation to OneDrive or SharePoint Online for Office 365, PowerPoint prompts you to do so now. After you do that, the email invitation will be sent. Open the presentation and start working in it. If someone else is viewing or working in the presentation, their thumbnail picture appears in the top-right corner of the ribbon. PowerPoint alerts you when people enter or leave your presentation. 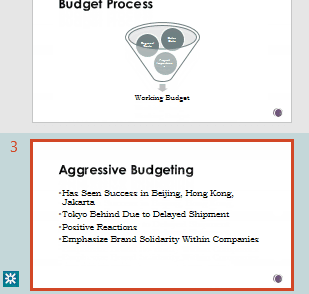 You'll also see the name of anyone viewing or editing the presentation in the Share pane. 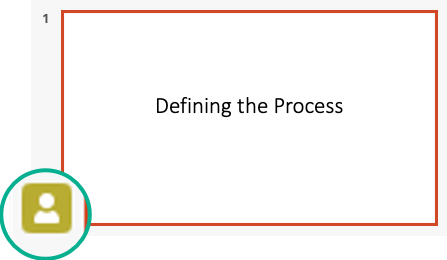 There's an indicator—on the thumbnail of the slide and in the actual slide—that shows where someone is working in the presentation. Hover over or select that indicator to find out who is editing. When you’re done working, save your file. When other authors have made changes, you’ll see the following when you save. If your updates and other authors’ updates don't conflict, they'll be merged automatically, and you don’t need to do anything else. 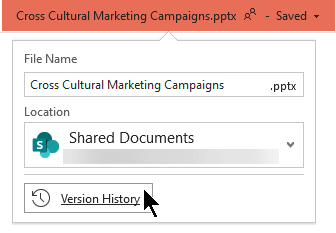 After other people make changes to a shared presentation file, PowerPoint for Office 365 notifies you when you re-open the file. A small banner tells you who has made changes to your presentation while you were away. PowerPoint for Office 365 automatically keeps track of changes made in online documents. When you re-open a changed presentation (or are in a file being actively edited by someone else), changed slides are highlighted in turquoise in the thumbnail pane. A tooltip says, "Slide has unread changes." Select a thumbnail to look at the full-size slide. You'll see the changed portion of the slide outlined in turquoise. An accompanying notation tells you who made the change, and when. This feature works on shared documents stored in OneDrive and SharePoint. If the privacy options are turned on, then this revision highlighting feature is turned off, meaning that no personal data (user names and times mentioned above) is stored. To make revision highlighting possible, data about the read/unread status of individual slides is stored separately by PowerPoint. Where that data is stored depends on which version and channel of PowerPoint you are using. We're shifting towards storing it in an online Microsoft service designed to save user settings, but we haven't entirely completed the shift yet. This location is protected by the Windows Users folder; if you want to, you can manually delete the files that record your own read/unread status. Changes aren't highlighted if the file is encrypted or password-protected. Changes aren't highlighted if the file is in .odp format or the older PowerPoint .ppt or .pps format. Choose Comments to make or view comments. Also, you can reply to or resolve comments and then mark them as complete. See Add comments for more information. (Office 365 only) You can instantly chat with other people who are working in a presentation stored on OneDrive for Business or SharePoint Online. Choose the Chat button to start a group chat with everyone working in the document. The chat history isn't preserved, so if you close the document and reopen it later, you'll be starting fresh with an empty chat. If you need more persistent discussion, consider using Comments instead. If another person opens the file to edit it, they can join the chat, too, but they won't see any history of the chat from before they opened the file. They'll only see new messages as of the time they opened it. Office preserves prior versions of your SharePoint, OneDrive, and OneDrive for Business files while you’re working on them. To open the list of the prior versions of a file, select the file name in the title bar of the app window, then select Version History. Version History is for viewing, not editing. You can see any prior version of a file. In the Version History pane on the right, select Open version in one of the version-history items. A read-only copy of that version is opened in a separate PowerPoint window. If there are conflicting changes, a visual comparison between your changes and the conflicting changes from one of your collaborators will pop up when you select Save. You can choose the changes you'd like to keep. Only changes made by others that directly conflict with changes you've made will show up in the comparison. Non-conflicting changes are merged automatically into your presentation when you save, and you'll see them in the My Changes view. Choose either My Changes or Changes by Others. Choose Next to keep resolving conflicts. Choose Previous to revisit an earlier conflict. If you'd like to choose the same set of changes for all the remaining conflicts, select the Do this for remaining conflicts check box. When you're done resolving conflicts, choose Done. 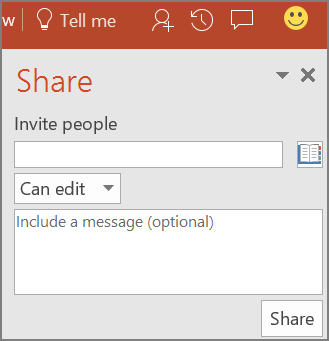 Create a draft of the presentation, and then save it to a shared location, such as OneDrive or SharePoint. Open and start working on the presentation. Note: If someone else is working on the presentation, you’ll see a Co-authoring icon and a number in the status bar that tell you how many people are working on the presentation. Click the Co-authoring icon to see who is working on the presentation (as shown below). When you’re done working, click File > Save. If you’re the only one working on the presentation, the file will save and you’re done. If your updates and other authors’ updates do not conflict, they will merge automatically, and you don’t need to do anything else. To view only conflicting updates, click Show Only Conflicts. To view all changes, click Show All Changes. To accept a conflicting change, check the box next to the conflicting change icon (shown below). To reject a conflicting change, do nothing. Boxes that aren’t checked won’t be added to the presentation. To accept a standard change, do nothing. To reject a standard change, clear the box. When you’re done reviewing changes, select Close Merge View. After you select Close Merge View, all changes will be applied and uploaded to the server. Note: After you select Close Merge View, you can't go back and view flagged changes. 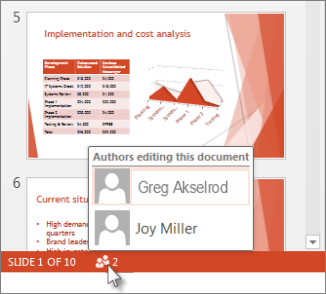 Open your PowerPoint presentation, and at the top-right corner of the ribbon, select Share and then select Invite People. Enter the email address of the person you'd like to share the presentation with. If you already have the person's contact info stored, you can just enter the name. The control at the top lets you determine whether your invitees can edit the file or only can view the file. After other people make changes to a shared presentation file, PowerPoint for Office 365 for Mac notifies you when you re-open the file. A small banner tells you who has made changes to your presentation while you were away. PowerPoint for Office 365 for Mac automatically keeps track of changes made in online documents. At the right end of the toolbar ribbon, select Comments to see all comments currently in the presentation. You can add a new comment or reply to or resolve existing comments. (Office 365 only) Tag a colleague in a comment by using the @-sign followed by the person's name. That person receives an email message with a link to your comment. Clicking the link brings them into the document and into the conversation. (Office 365 only) You can Chat with someone who's editing the file at the same time as you. To get started, click the chat icon near the top right of the screen. To open the list of the prior versions of a file, select the file name in the title bar of the app window, then select Browse Version History. You can copy content from a prior version. You can also Save A Copy of a prior version so that you can edit it separately from the file you're currently working on. In the Send a link dialog box, enter the names or email addresses of the folks you want to share the presentation with. Add a message to your colleagues if you like. In the pane on the left side, a presence icon appears next to a slide thumbnail if someone is editing that slide. Point your mouse at the icon to see who the person is. 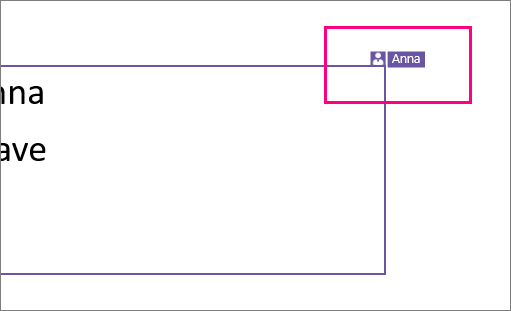 In the main slide pane, a presence icon shows you when someone is editing a particular element on the slide. A While You Were Away message appears on the right side of the window. In the slide thumbnail pane on the left, slides that have been revised are highlighted with a turquoise background. When you open that slide, you'll also see a turquoise outline around the revised slide element. Tag a colleague in a comment by using the @-sign followed by the person's name. That person receives an email message with a link to your comment. Clicking the link brings them into the document and into the conversation. You can Chat with someone who's editing the file at the same time as you. To get started, click the chat button near the top right of the screen. Use File > Info > View and restore previous versions to open the list of the prior versions of a file. Version History is for viewing, not editing. You can see any prior version of a file. You can copy content from a prior version. You can also Save A Copy of a prior version so that you can edit it separately from the file you're currently working on.